Singapore-headquartered financial technology company fastacash Pte Ltd has raised $15 million in Series B funding from Rising Dragon Singapore to strengthen its tentacles in India and other large markets. The company will use the money to build a foothold in India, which is one of the the world's largest market for inward remittance, as per a press statement. fastacash will also deploy the funds to further expand into the US, UK, Europe, the Middle East and Southeast Asian countries. Remittances to India have grown by eight per cent year-on-year to reach about $77 billion in 2014. As per World Bank Data, India is the largest recipient of inward remittances globally. fastacash, which has also raised money from International investors such as Life.SREDA, UVM 2 Venture Investments LP and others in this round, will use the money to further expand into the US, UK, Europe, the Middle East and Southeast Asian countries. "Our company was created out of the desire to eliminate consumer pain points associated with payments and money transfers, be it international or domestic. Our technology has made what was a cumbersome and often laborious process as easy as the swipe of a finger. With Series B, we will scale fastacash's business by accelerating consumer usage, delivering product innovation and expanding our global reach," said Vince Tallent, chairman and CEO of fastacash. 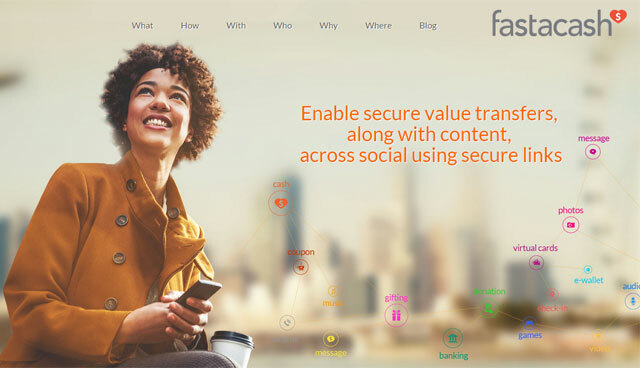 Founded in 2012 by Tallent, a non-resident Indian, fastacash provides a global platform that allows users to transfer money, airtime, other tokens of value along with digital content like photos, videos, audio, messages through social networks and messaging platforms. Tallent has over two decades of experience in the telecommunications, media & technology (TMT) industry. He has been on the boards of companies such as Ingenico, MACH, Mobile 365, Roam Data and Transfer-To. fastacash provides services in India, Indonesia, Russia, Singapore and Vietnam. Through its partners, fastacash claims to have acquired over one million end-users till date. With this latest round, fastacash has raised an overall sum of $23.5 million till date. Last year, Fastacash raised $4 million in an extended Series A round, led by Jagdish Chanrai, a principal of the Kewalram Chanrai Group, and Golden Oriole Investments. It also raised $3 million from Singapore-based Jungle Ventures, Spring SEEDS Capital, the investment arm of SPRING Singapore, and Hong Kong-based Funding the Future (FTF Ltd). In 2012, it had secured $1.5 million in seed funding led by Hong Kong's Funding the Future (FTF Ltd).